3 Reasons why New Moon is the NEW New Year! I am just emerging from a deep dive of solitude over the Winter Solstice period (some call this Christmas). We spent our very first Christmas in our new country (France) – far away from our families (and yes I do miss them) and from the human kingdom at large. We spent Christmas day in 16C, with the doors wide open and went for a long walk through the pine forests. We are finding our way here in our new life and I am so aware that my deep immersion in nature (since the Summer Solstice) is changing me at a deep level. To the left is a photo of Gorse that is in resplendent bloom here right now and part of the forest trail we walked on Christmas day. This Gorse later helped me co-create a moonlight Full Moon essence for the MoonFlower range – which felt very special to do on Christmas Day. 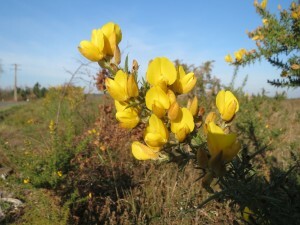 Gorse energy is also overlighting the energy of this blog – as you will see by reading more below – as an ally to bring light to what we previously believed what was not possible. We stayed quiet over New Year period too – and here is why. For many years I have struggled with the hype around New Year. Like us all I have set half-hearted resolutions that I did not continue with. Looking back part of this was because I knew there was no way I would follow through so I set goals that did not come from my heart. As the years go by and I live my life more and more by the nature and celestial kingdoms, I saw this year so clearly my own truth as to why this is. January 1st this year (2016) fell during the waning moon phase. 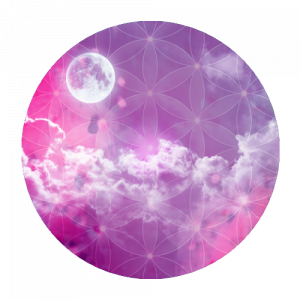 Waning moon is a time for quiet reflection – the total opposite to the energy of taking action. Here in the Northern Hemisphere, nature is at her stillest point – as a response to the low light and temperatures. You may know that a very large percentage of resolutions set on January 1st have been given up by January 15th. I really understand the true feelings of disappointment and hopelessness that can be felt when year after year we set a goal to be a better version of ourselves and yet we lack the energy and support to see this through. 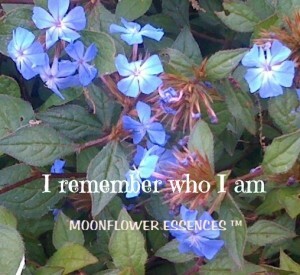 -New Moon is a magical time to begin again. At this time the sun (our masculine, creative side) and moon (our feminine, reflective side) rise at the same point in our sky and hence the energy is supportive of making a decision from a place of balance. 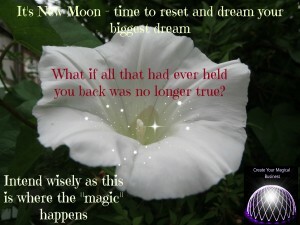 New Moon is a potent reset point and can be used as such at all times of the year. Yes we have 13 times each year to reset and begin again. That feels so much better doesn’t than having to wait until January 1st 2017? -The mass consciousness on January 1st is a powerful one and in some ways this is positive as it almost forces us to think about a new year’s goal. The media is full of messages as to how we should be slimmer, do more exercise, stop habits that are frowned upon etc etc. However, when we make decisions from outside of our heart space, they have no roots and during the slight winds of challenge, we give up. -Set up routines in your life whereby you reset your goals every New Moon allowing yourself to be supported by nature. 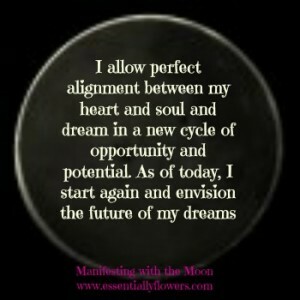 As described above, New Moon is a perfect time to do this work.When you set these goals, do so from your heart space. -Create a ritual in your life each time you do this. Light a candle, play some uplifting music, take essences, use essential oils and crystals – set the scene in whichever way is yours to draw down the magic of your own heart. It takes a few extra minutes and yet eons of difference to the outcome. If you are a complementary health practitioner or light worker who wants support in growing your healing business, why not have a look at our Create a Magical Business programmes? If you have enjoyed reading this blog, please do leave a comment and let me know about your experiences of setting resolutions at New Moon or at any time of year. I’d love to hear from you. Reading this away from the New Year and / or New Moon? Don’t worry – we can begin again and make deep heart based choices to be different on any day at any time. So right now in this moment, close your eyes, take a deep breath and Remember Who You Truly Are and make a new decision from this place.